Most tomato sauce recipes have a list of ingredients a mile long. Needless to say I was a bit sceptical when I saw this recipe with only five very basic ingredients. But I am game to try anything as I have tomatoes coming out of my ears. Since the first pot, I have gone on to make 3 more batches. I love the shiny red colouring of this sauce. You can also add garlic, chilli or whatever you feel like to these base ingredients. 1. Clean and cut the stem off the tomatoes. 2. Add all the ingredients into a thick base pot and boil until slightly thick. 3. For a smooth sauce, whiz the sauce with a hand blender. Omit this step if you like some chunks in your sauce. 4. Continue cooking until the desired thickness. Once it starts to thicken, watch and stir constantly. The whole process from start to finish takes about 1 hour. 5. Sterilise your jars and bottle the tomato sauce immediately. 6. Label and store in a cool place. 1. I have used the lower of the measures for sugar and vinegar as I don't like my tomato sauce on the sweet or vinegary side. 2. Once the jar or bottle is opened, store in the fridge. 3. Do not double the recipe as it will take too long to thicken. Better to do a 2kg batch each time. 1. If you do not like the skin in your sauce, lift if off with a chopstick or fork as the sauce boil away as the skin will float. This saves the extra step of pre-blanching to remove the skin. 2. To sterilise my jars, I pop them into the microwave and zap them until they are dry and super hot. I keep and re-use all my poptop jars. 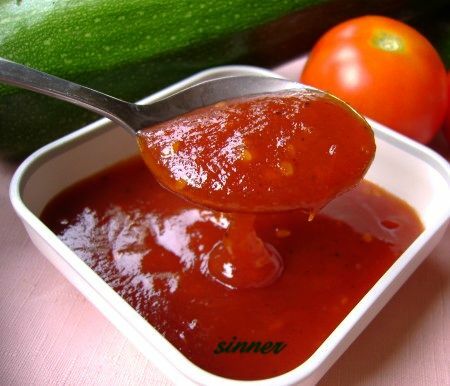 This is good idea to make our own tomato sauce. Both my husband and I are diabetics and we had cut out tomato sauce bcos of it high sugar content. We maybe able to use this if we can lower the sugar without changing the taste too much. Good morning, by the way sorry to ask what is ground Alspice, never heard of this before. Thanks. That's the advantage of homemade stuff. You can adjust to suit your own taste. I have a photo of some whole allspice here. The whole allspice is harder to find in shops. The ground ones are more common. I prefer to buy 'whole' (and grind them myself when I need them) rather than ground spices as the whole ones don't loose their fragrance. They are slightly more expensive than the ground ones. Good morning, thank you so much for taking the trouble to show me the picture of allspice. If I am not wrong I have use it before for the Tau Yiu Bak (Black Sauce Meat. It is very fragrant & I bought it from chinese Medical shop & in cantonese it is called Cho Kor. Hope I am right. Thanks. The allspice is indeed very fragrant. Funny how they sell spices in chinese medical shops back home. Good morning, infact back here you can find quite of handfull of spices sold in Chinese Medical Shop. Thanks. Just what I've been looking for at the right time! I may just try this tonight...thanks for the recipe! Hi I am waiting to make this but need to know what type of vinegar you used? There are so many and each one would taste differently? Hi Oakman, I just used the plain white vinegar.